For years, small businesses have counted tax issues among five of their top ten problems, according to NFIB’s Small Business Problems and Priorities survey. The tax relief bill presented the biggest tax overhaul in more than three decades, and it dramatically improved the landscape for many small businesses. The centerpiece of these tax changes is the new small business deduction. This deduction is important because more than 90 percent of small businesses are organized as pass-throughs (S corporations, LLCs, sole proprietorships, or partnerships), not as corporations. Pass-through business owners – regardless of the type of business they own – can now claim a full 20 percent deduction on their share of the business’s income up to $315,000 in 2018 for those filing jointly. For small business owners whose taxable income exceeds the threshold, the deduction is subject to formulaic limitations. Coupled with increased thresholds for the alternative minimum tax and estate tax, a doubling of the standard deduction, and a significant increase in the expensing limits, the benefits to small and independent business owners are substantial. These positive changes have driven record optimism in the small business community. Sales are strong, profits are good, and employee compensation is increasing. However, without additional congressional action, these important small business provisions are scheduled to expire after 2025. Reps. Jason Smith (R-MO-8) and Henry Cuellar (D-TX-28) have sponsored the Main Street Tax Certainty Act, H.R. 216, to ensure the small business pass-through deduction is permanent. Sen. Steve Daines (R-MT) has also introduced S. 1149, the Main Street Tax Certainty Act. 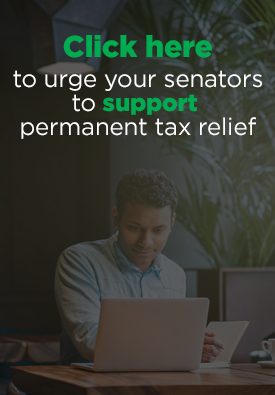 Please encourage your Representative and Senators to cosponsor this critical legislation to provide certainty to small business owners. Learn more about the law. 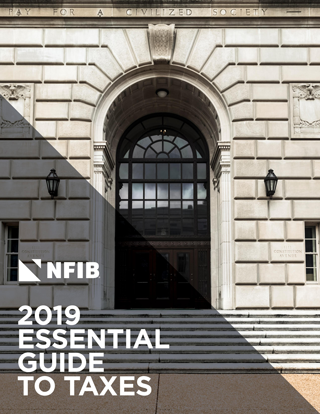 Use NFIB’s guide to understand the Small Business Deduction and other provisions that benefit you. 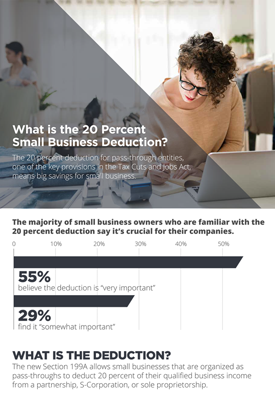 Our infographic below details how the 20 percent deduction means big savings for small business.